Like its larger, more powerful MacBook Pro siblings, the 2017 MacBook received a minor CPU speed increase with the adoption of Intel Kaby Lake processors. Beyond that, not much has changed, but Apple's latest thin-and-light boasts substantial improvements in efficiency and lower heat output that could strike a cord with on-the-go users. As a minor refresh, the only visual differences between the 2017 MacBook and its predecessor are a couple of updated logos on the control and option keys. The overall chassis design remains unchanged, but the sleek lines are still fresh compared to Windows PC offerings. 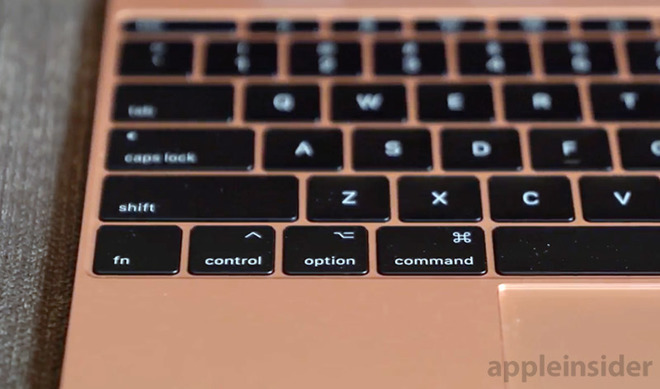 Opening the device, users will find the keyboard has been updated with second-generation butterfly switches first introduced with the 2016 MacBook Pro. The keys have been tuned to offer more travel and a "clickier" feel than first-generation parts and are a welcome addition to the low-profile design. This year's MacBook sports the same dimensions as the 2016 model, with a tapered chassis running from 0.14 inches at its slimmest point to 0.52 inches at the hinge. Width and depth remain static at 11.04 inches and 7.74 inches, respectively, while the entire package weighs in at just 2.03 pounds. Headlining this year's upgrade list is a move to Intel's latest Kaby Lake family processors. Although these new processors don't offer a major increase in performance, they do provide substantial improvements in efficiency and lower heat output. 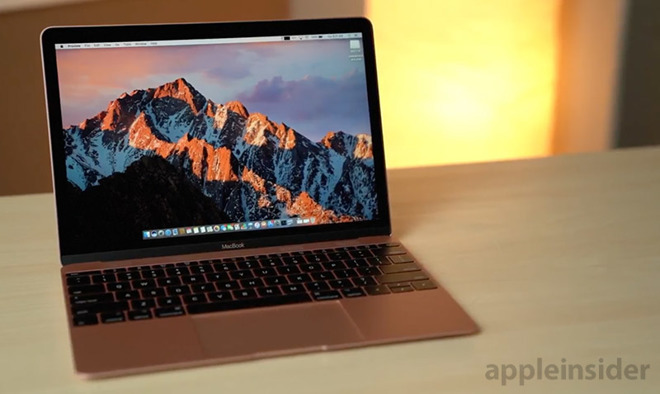 Lower thermals is particularly important for the fanless Retina MacBook, a hardware design that sometimes causes issues with overheating, which in turn leads to CPU throttling. This year's base model 12" Retina MacBook comes with a 1.2GHz dual-core Intel Core m3 processor with 8GB of RAM and 256 GB of storage, up from a 1.1GHz dual-core Core m3 in 2016. Higher tier versions start with a 1.3GHz dual-core Intel Core i5 with Turbo Boost up to 3.2GHz and 4MB L3 cache, and can be configured up to a 1.4GHz dual-core Intel Core i7 processor. The 8GB of RAM is exactly the same compared to last year's model, except buyers now have the option of upgrading to 16GB for an extra $200. Graphics also gets an update from Intel's integrated HD 515 to HD 615. Although a very minor change, the new Macbook gets Bluetooth 4.2 over last year's 4.0. The move to Intel's newest Kaby Lake processor nets MacBook a 100MHz increase in base clock over last year's model. Even more impressive is that the new chip turbo boosts up to 3.0GHz instead of 2.2GHz. These updates sound good on paper, but we wanted to see how the machine performs in real world tests. We ran through a few benchmarks to find out. Overall, we found an average increase in CPU performance of around 26 percent and graphics performance of about 50 percent compared to the 2016 MacBook. Importantly, Intel's latest chips are extremely efficient. Even with the higher clock speed we found that battery life for video viewing increased by up to 2 hours compared to last year's model. Longevity remained the same for other tasks like web surfing, suggesting Apple's hardware is tuned for video playback. Apple promised major performance enhancements with MacBook's storage, and the SSDs didn't fail to impress. We tested the flash storage with a Blackmagic disk test and found the new modules to be around 63 percent faster than the previous model, offering faster transfer speeds as well as quicker boot and app loading times. Since the 12-inch Macbooks are fanless, it becomes increasingly difficult to dissipate heat while executing CPU-heavy tasks for extended periods of time. The only way to reduce heat is to throttle down the processor, which results in lowered performance. We tested thermal efficiency by continually looping the Cinebench R15 CPU benchmark and witnessed a decrease in scores of around 8 percent for the new Macbook, and 12 percent for the previous model. Buyers should be aware that Apple's ultraportable, while capable of performing everyday tasks, is not a performance machine. The biggest issue with the new 12-inch Macbook is its price. With $1,299, prospective buyers can grab the latest base model 13-inch MacBook Pro instead. Performance wise, the step-up Pro model is better in every way, save for a meager 128GB of storage. With MacBook, Apple is targeting road warriors and users looking for the thinnest, lightest, and most portable system on the market. For most users, however, the performance benefits offered by the base MacBook Pro far outweigh sleek design. The Pro version gets better speakers, better FaceTime camera, a bigger touchpad, a bigger, brighter, more colorful display with increased resolution, and major performance improvements. It even gets double the usb-c ports with the option of adding more. Most importantly for Apple's connectivity-constrained MacBooks, each port on the MacBook Pro supports Thunderbolt 3. Unless portability is extremely important to you, our advice is to skip the 12-inch MacBook and go for the new 13-inch MacBook Pro instead. Those in the market for a new Mid 2017 12-inch MacBook can exclusively save $50 on every configuration at Adorama with coupon code APINSIDER. This bonus discount is on top of Adorama's already reduced pricing, making the total savings $70 off MSRP. Adorama also will not collect sales tax on orders shipped outside NY and NJ —another $174 to $220 in savings for many shoppers compared to paying full price with tax at the Apple Store. To redeem the coupon, please see the step-by-step instructions below. And for a full list of deals, please visit our 12-inch MacBook Price Guide.